The State government wants to see Belagavi grow into the second IT capital, on par with the IT capital Bengaluru, and is now focussed on achieving this challenging task, said Minister for IT, BT, S&T and Planning S.R. Patil. Inaugurating an IT and electronics conference, “Buzzing Belagavi-The Next Global Technology Hub”, aimed at showcasing the potential and strengths of Belagavi for the promotion of IT and electronics clusters, essentially a mini IT investors meet at the Suvarna Vidhana Soudha here on Friday, he said that Bengaluru has shown the way to become an IT capital following the concrete measures taken by the former Chief Minister S.M. Krishna. Now, the Siddaramaiah government has focussed its attention on tier two and tier three cities and towns, including Belagavi, Hubballi, Kalaburagi and Bidar of North Karnataka. He said that Belagavi was rich with natural resources, infrastructure, trained and skilled manpower, air, road and railways connectivity and access to sea ports at a distance of about 150 km, besides salubrious weather, making it ideal for investments. Accordingly, several incentives and promotional schemes had been ensured for the industry leaders and prospective entrepreneurs coming with commitment and concrete plans to become part of Karnataka Start Up. The government has announced IT parks in Belagavi, Bidar and Vijayapur and proposed to start a technology incubation centre in Belagavi besides eight other centres under the Karnataka i4 (IT, ITES, Innovation Incentives) Policy. One of the main reasons to promote tier two and tier three cities and towns was to stall migration of educated and trained/skilled manpower to Bengaluru and other metros. He stressed that the global IT market’s prospective demand of around four billion dollars by 2020 had thrown open more opportunities for Indian players. This was the time to grab this opportunity and take steps, even as the State was looking forward to claiming its share of at least 10 per cent of the demand through its IT and Karnataka Electronic System Design and Manufacturing Policy 2013. As of now, of the total 15,000 IT industries in the country, the State has 5,000 units employing at least 40 persons each. The employee strength was poised to become double in next four or five years. Karnataka Start UP aims at creating six lakh direct and another 14 lakh indirect employment opportunities. IT exports account for Rs. 2.20 lakh crore annually, which was one-third of India’s total IT exports and more than the State’s annual budget. 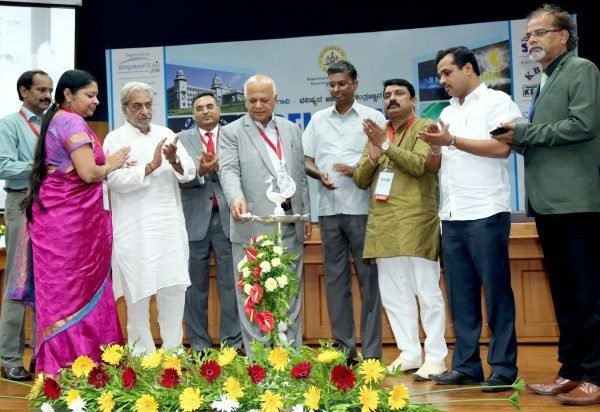 The event was hosted by Department of IT, BT and Science & Technology and supported by Karnataka State Small Industries Development Corporation Limited along with the Belagavi district administration, Karnataka State Electronics Development Corporation Limited (KEONICS) and National Small Scale Industries Association (NSIC). Leading industry associations, including NASSCOM, FICCI, IESA, CLIK, FKCCI, Belgaum Chamber of Commerce and Industries, NKSSIA, TiE-Hubbali, KCC&I, BITA and Deshpande Foundation too supported it. Small Scale Industries Minister and district in-charge Satish L. Jarkiholi said that the government had taken a decision to enable entrepreneurs to purchase land directly from private owners. Delivering the keynote address, Arvind Meligeri, Chairman and CEO of India’s first SEZ in aerospace near Belagavi, suggested that focus should be on developing a 100-km IT corridor by connecting Belagavi and Hubbali and eventually developing them into mega twin cities instead of focussing on the two cities individually. He also suggested the construction of a much-needed ring road and create other necessary facilities in Belagavi city before it was too late. Mahantesh Kavatgimath, MLC, said that mere assurances and slogans were not enough to promote industries but concrete and committed steps alone helped achieve the objectives. Feroz N. Sait, MLA, suggested a time-bond action programme and deputing a dedicated team of officials in Belagavi to transform the city. Earlier, Regional Commissioner N. Jayaram highlighted the strengths of Belagavi. Sanjay B. Patil, MLA, presided over the inaugural function and urged all political leaders to work for the progress of the city by setting aside their political differences. V. Manjula, Principal Secretary, Department of IT, BT, and S&T, highlighted the salient features of the State’s IT policies and the steps being taken to implement them. I hope this dream soon comes true !! !